Hostas are so commonplace in our gardens that it is almost impossible to think of them as originating in the wild. Indeed, for as familiar as we are with this genus, it is actually quite difficult to find out anything about their ecology. As with any garden species, however, Hostas had to come from somewhere! From phylogenetic analyses, we can infer that the genus Hosta originated in east-central China. The most basal member of the group, H. plantaginea, can still be found growing there today. From its Chinese origin, the genus migrated throughout Asia, into Korea and Russia, and even crossed ancient land bridges into what is now the Japanese archipelago. Once there, the genus went through quite an adaptive radiation. Hostas in situ on a rock wall. In the wild, as in our gardens, Hostas tend to grow in shaded forests with rich soils. 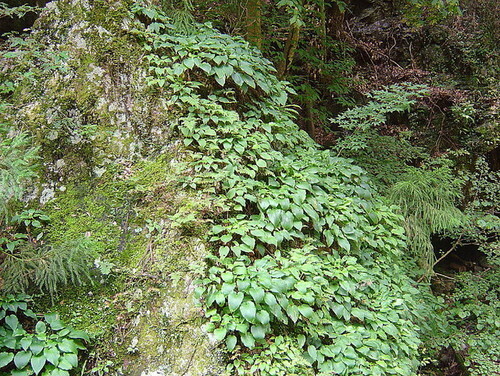 However, some species are at home growing on steep slopes or even rock walls. Most take on a growth form we would readily recognize as a Hosta, however, the leaves of wild Hostas do not exhibit the rich variegation we have bred into them. Although many wild species have found themselves in cultivation, it is interesting to note that some of the first specimens brought back to Europe from Japan may not have been wild Hostas at all. European explorers would often task Japanese locals to collect plants for them. What were once thought of as type specimens were actually taken from ancient temple gardens that had been in cultivation for hundreds of years. As such, plants that were once described as true species, such as Hosta fortunei, have now been reduced to cultivar status. Love them or hate them, Hostas are an important part of horticultural history. They have gained worldwide recognition and will continue to be planted in gardens all over the world. However, their horticultural prevalence has overshadowed their ecology. I find this to be a bit sad. It is all too easy to forget that nature has produced these organisms. We have simply tinkered with them. We must not forget that every garden species comes from somewhere.